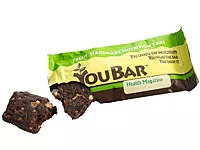 Can’t find the perfect-tasting energy bar? Create your own. Choose your favorite ingredients from organic nuts, seeds, grains, dried fruit, chocolate chips, and more. We love that you get to see your bar’s nutritional content as you go. For $40 you get a dozen bars with personalized labels. Almond butter + organic dates + whey protein + cashews + organic honey + cocoa + organic apricots + organic coconut + organic cherries + organic flaxseeds + multivitamin infusion = a protein- and fiber-packed bar with more than 30% of your daily calcium—all for less than 200 calories!